The first six months of 2013 are now behind us so let’s take a look at Portsmouth NH real estate sales and see how they compare to the first six months of years past. 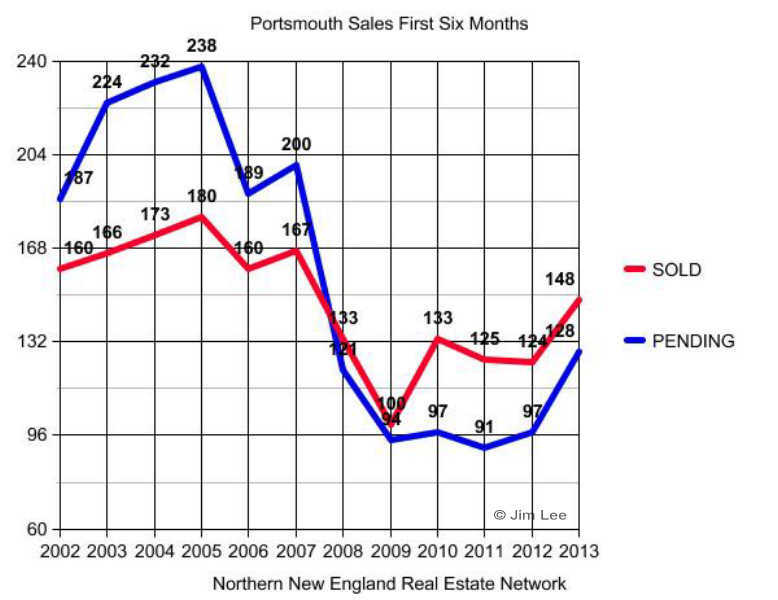 As you can clearly see from the chart above, sales in the Portsmouth NH market are on the upswing. Our market ‘bottomed out’ around 2009 and has been in a pretty slow but steady recovery since then. With record low interest rates continuing to be available why aren’t sales even more robust than they are? I believe one big dark cloud hanging over the market is a fairly high unemployment rate which just won’t go away. We’re now had 54 consecutive months of unemployment numbers above 7.5! That is the longest stretch of unemployment at or above that rate since 1948, when the Bureau of Labor Statistics started calculating the national unemployment rate. According to the Northern New England Real Estate Network (NNEREN), Portsmouth New Hampshire currently has an absorption rate of 3.7 for single family residential properties and 5.2 for condominiums. That means that it would take 3.7 and 5.2 months to sell all the Portsmouth homes currently for sale and assuming no new listings came on the market during that time. Absorption rates are a method of calculating the market health. If an absorption rate is above 6 months it is generally considered to favor home buyers; below a 6 months supply generally favors home sellers. 3.7 and 5.2 are positive signs we’re in a sellers market. Unfortunately that happy news for sellers is tempered by the fact we also have an inventory shortage; not enough homes to meet the demand. That has me wondering if some Portsmouth NH sellers who tried to sell recently and failed to get an acceptable offer have just given up and delayed or changed their plans and decided to wait for better times. If you’re a seller and you’re waiting, better times are here right now. Bottom line; while sales are pretty good, they’re still not great. What will it take to return to great? One word: JOBS! Jobs and more faith in the economy which is also lacking. Portsmouth NH real estate questions or comments? Drop us an email or give us a call. My partner Ann Cummings and I are always happy to talk real estate; it’s out best subject. 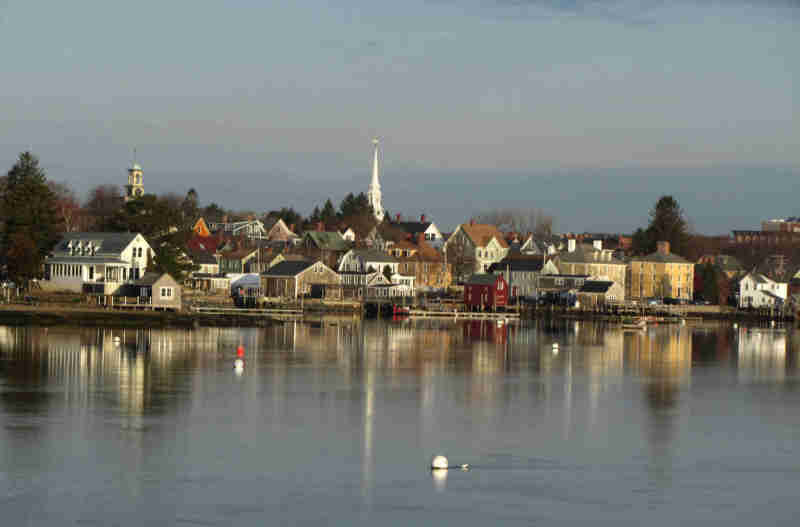 Visit NewHampshireMaineRealEstate.com to see beautiful Portsmouth NH homes like the ones below that could be yours. Your insights on the national economy and unemployment rate are helpful. Looking at your graph, it appears the Portsmouth N.H. market accelerated in recovery during the first half of 2013. The record low interest rates seem to be fading away, what is your take on that change and the housing market? Thanks for your comment and your question Bob. I think the record low interest rates are here to stay for at least a few more months if not another 1-3 years. The national economy is not rebounding as robustly from the recession as folks would like it. Unemployment is still very high and consumer confidence is still fairly low too. It will take some improvement in both those areas before the federal reserve will feel the need to step and raise rates to keep inflation under control.